Xseries expansion board supplies the RPi with a regulated +5V through the GPIO header using a 2A poly-resettable (PTC) fuse. With the wide voltage input range (6~18vdc), the RPi can be powered from a wide variety of external sources such as batteries, 12V power adapters, solar battery sources, etc. 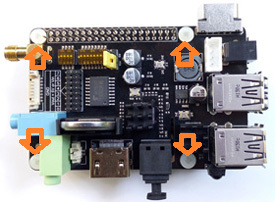 Warning: do not connect a +5V supply through the Raspberry Pi micro-USB connector when used with this expansion board. 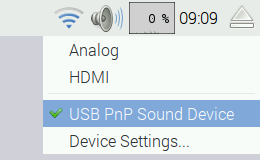 To configure X300 sound card as the default audio device. 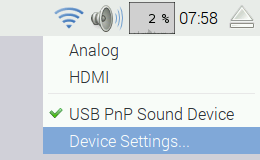 <1> Right-click the volume icon, a pop-up menu appears to allow you to select "USB PnP Sound Device". 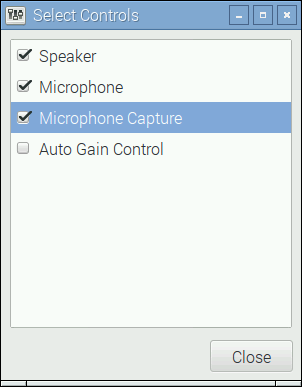 <2> Click "Device Settings..." to allow more detailed control of the X300 audio devices – you can access this either under Device Settings from the volume right-click menu or from the Preferences section of the main menu, where it is listed as Audio Device Settings. <3> From this dialog, select the device you want to control from the drop-down at the top, and then press the Select Controls button to choose which of the controls the device offers that you want to display. Pressing the Make Default button on this window has the same effect as choosing an output source in the volume right-click menu. <7> Ensure that the CR2032 coin battery was inserted into the battery holder. Using the expansion board without a battery installed may damage the RTC chip and will stop it from appearing on the I2C bus. <8> Follow the instructions on how to install and configure I2C on Raspbian Linux. If everything worked correctly the expansion board should be initialised on boot and the current date and time will be loaded into Linux. <22> Add the two lines below to /etc/modules . This will start the modules up on boot. Pin 8 bellow will be used to take the output from the IR sensor. <25> Edit /etc/lirc/hardware.conf and have it appear exactly as shown below. The highlighted text are the parts that will need changing, though it’s worth checking the rest of the text incase you have a different initial configuration. 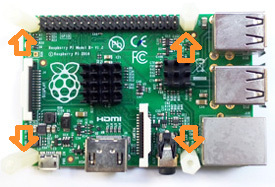 The SATA port allows you to connect SATA devices to your Raspberry Pi, a very useful tool for data transfer, backup and cloning. It supports most SATA devices such as CD ROM, DVD ROM, CD drive, 2.5 inch hard disk and 3.5 inch hard disk. 1. Connect you SATA drive to the SATA port with a SATA cable. 2. Connect SATA Power Cable to a power adapter which is used to power hard disk OR to the power connector on X300 (Output voltage of power adapter used must be 12Vdc). To establish a communication with the Raspberry Pi over Bluetooth you need another device that can speak Bluetooth. If your computer has a Bluetooth adapter then you just need to find a terminal software that you can use to send and receive data, like HyperTerminal on Windows, or screen on OS X and Linux. A computer is not the only choice, though. For example, I will use my Android cell phone with the free BlueTerm (download from Google play) app installed.